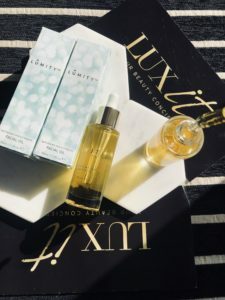 The key to gorgeous glowing skin is in the products you use, we have recently had the pleasure of trying the Lumity facial oil and loved it! We know how much our readers love a trustworthy review and a hidden gem so we thought we would share our new favourite product and shed some light on how beneficial investing in facial oils can be. The key to gorgeous glowing skin is in the products you use, we have recently had the pleasure of trying the Lumity facial oil and loved it! We know how much our readers love a trustworthy review and a hidden gem so we thought we would share our new favourite product and shed some light on how beneficial investing in facial oils can be. This anti-ageing facial oil revolves around two key claims of being moisturising, balancing skin texture and appearance and delving into the specifics of how this product will work for you. Lumity’s website boasts great results when using their oil, we’ve listed a few here: It replenishes moisture for supple, smoother skin, it will reduce the signs of ageing, such as fine lines and wrinkles whilst restoring elasticity, radiance and firmness. This facial oil will reinforce the skin’s natural barrier to maintain perfect hydration, restore balance and youthful condition and lastly promote collagen synthesis to strengthen the skin’s structural matrix. Our review of their claim of 73% fewer wrinkles in 4 weeks is five stars! When we say this oil WORKS we are holding your hand like a trusted friend would, and telling you the golden secret! We’ve noticed we were left with significantly fewer wrinkles, with a golden sheen for a finish and thankfully it is not sticky to the touch. Like most of us, we always expect a little more information to be convinced, and the ingredients are quite impressive, to say the least; A concoction of the well known oils such as argan, sesame, jojoba and macadamia accompanied by passionflower seed, baobab seed, marula, safflower seed, camellia seed, meadowfoam seed and evening primrose. Among this list of extremely hydrating and moisturizing oils, this oil also includes green tea leaf and coffee seed extracts. If you’re wondering how and when to apply it, we have been loving cleansing our face with warm water and applying this oil using our fingertips before bed; and for those who have an oily skin type and worry this may break you out, as an oily skin type myself, I haven’t experienced anything other than glowing youthful skin. We can back this product 110% and are excited for you to try this new find!